Davide Rodoquino, like most teens, graduated from high school wondering what he wanted to do for the rest of his life. Unlike most teens, he enrolled in the Academy of Fine Arts, studying painting under the tutelage of Umberto Folli, student of Giorgio Morandi, a world-renown Italian artist active between the First and Second World War. 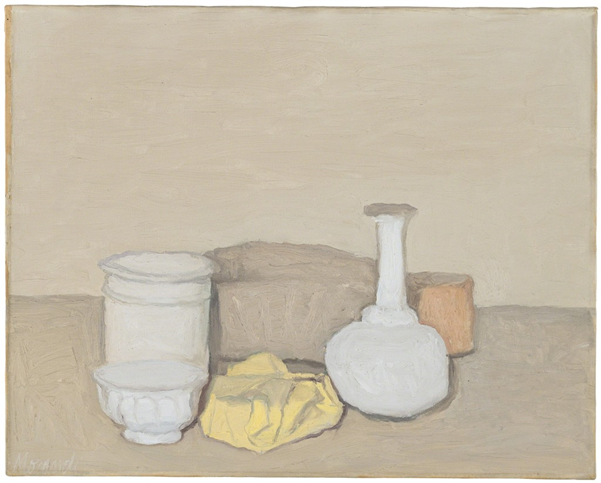 Under his guidance, Davide learned to appreciate the “unremarkable” of everyday household objects, a style developed by Morandi who sought to “communicate a sense of tranquility and privacy,” through his work, quite understandably as a place of refuge from his tumultuous background following the World Wars. Natura Morta, 1952. Oil on canvas by Giorgio Morandi. Nonetheless, Davide remembers his lessons fondly and seamlessly incorporates his teacher’s teachings into his own style, attributing his lessons on the “careful observation of the subject we have in front” and “care of the composition of masses in space,” a lesson he learnt on the importance in encapsulating all details in his large, scenic murals. Window of Italian Riviera. For Damarino Restaurant in New York, 2004. Q: How did you begin creating art? Each epic has a story of how one crossed the sea into the Land of New Beginnings. Davide emigrated to North Virginia, United States in 1992 by the pull of the magnetic American Dream. The first three years did not go as planned, and Davide found it immensely challenging to create, sell and share his works despite his repeated attempts in art competitions and exhibitions. 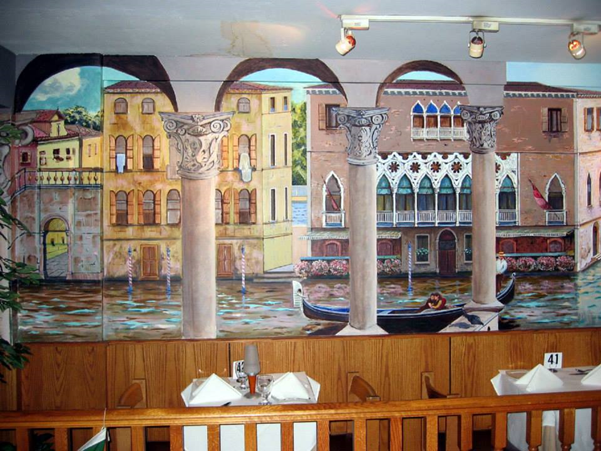 This all changed when a restaurant owner, a long-term fan of his, asked him to create a mural as the centerpiece of his restaurant. 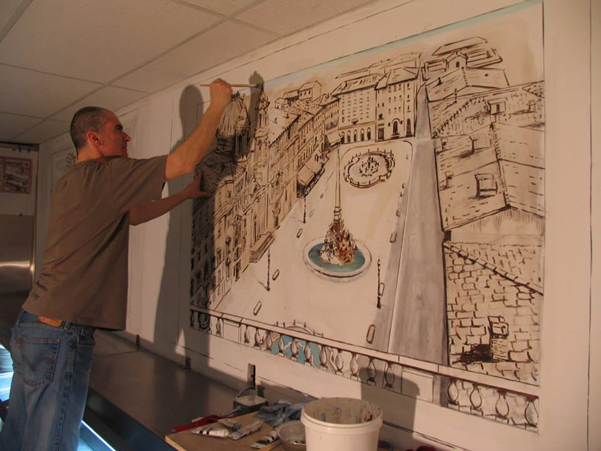 While recreating his favorite memories on the wall that would greet hundreds of customers a day, this is where the artist discovered his passion for painting stunning and grandiose wall art. 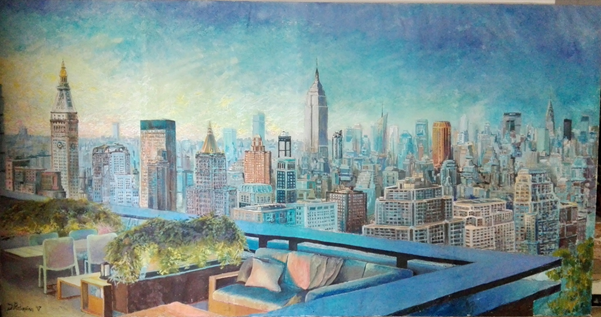 Mindful of his teacher Folli’s lessons, he has used his principle of envisioning live landscapes to transform mundane interior spaces into rolling fields, masking blank walls with the most beautiful cityscapes from across the world. When asked about America’s influence on his work, Davide replies: “More than influencing, America gave me the opportunity to express the best of myself with large-scale wall paintings. Therefore, it gave me the possibility to better bring out my characteristics as a painter — namely the ability to construct a three-dimensional space through the realistic use of light and colors in large spaces.” In 1997, after being published on various articles, Davide finally made the big move to New York in 2002, his ultimate envisioned dream since first moving to the States. 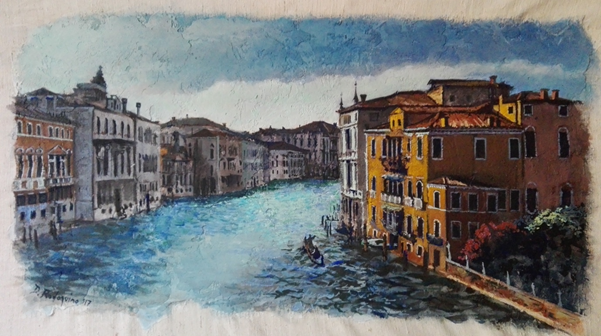 Completed Window of Italian Riviera, 2004. New York (Second Image): Triptych of Roman Squares, 2007. 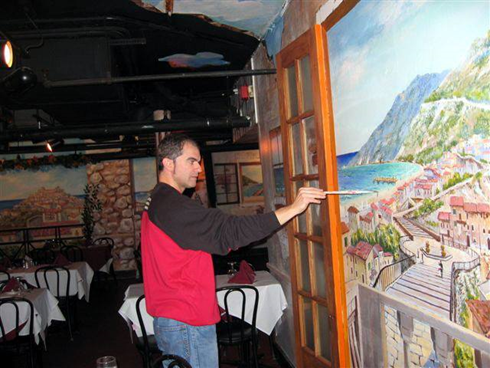 Painted for Joe’s Restaurant, Arlington, Virginia USA. Q: How did your work change in The Big Apple? 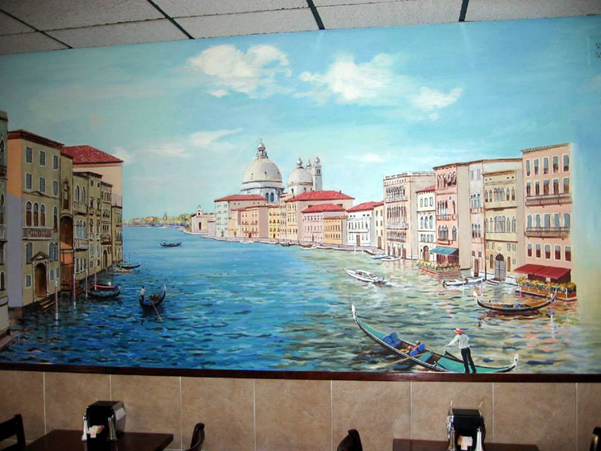 Davide’s passion for painting murals grew steadfastly over the years. 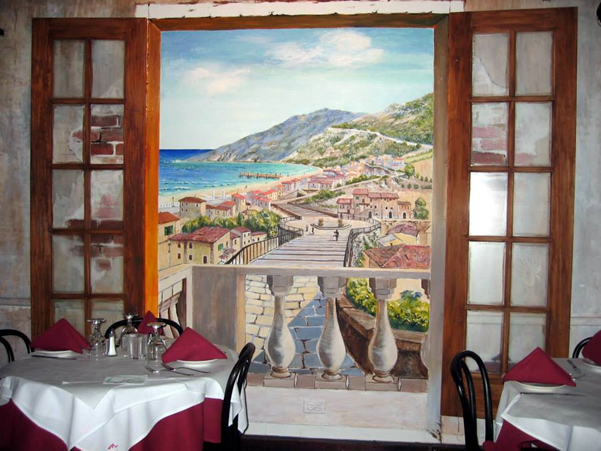 Over the years, his works culminated on the walls dotted around the city, decorating rooms of the best and most popular Broadway restaurants with art visualizing the heart of Italy. Meanwhile, the artist continued to branch out and practice on different mediums such as canvas by enthusiastically taking on commission work and other opportunities that allowed him to “undertake my spontaneous desire to paint in the open air.” While transforming the intimate living spaces around the city, he continued to develop his own craft and claimed wall art as his expertise. By 2013, it was time to go home. Venice seen from the top, 2003. For Le Te Venezie, New York. Q: How did your return to Italy transform your work? 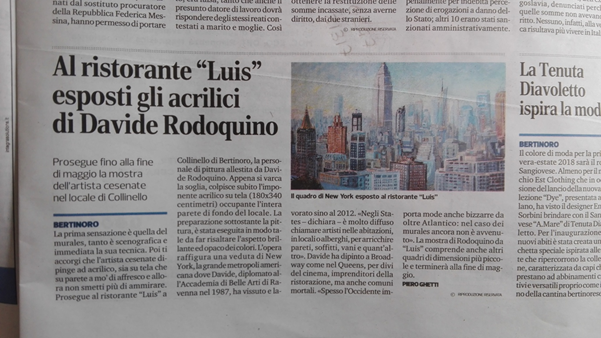 From Corriere Romagna, published 5 April 2018. Q: What inspired your art and what do you want to inspire through your work? 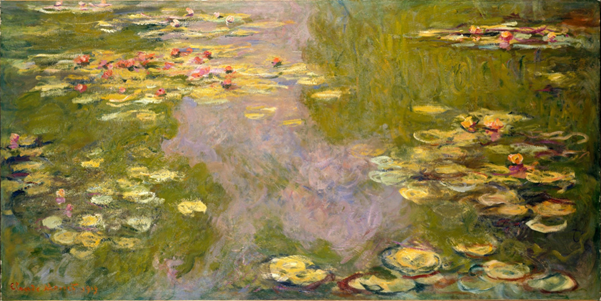 Davide pinpoints French Impressionism as his favorite artistic current, concluding his studies at the academy with a final thesis on Monet’s Water Lilies in Giverny. As an art movement starting in the mid 19th century, Impressionism was sparked by anti-establishment and a desire to depict modern life, unlike the painting the traditional historical or mythical subjects. Davide attributes Impressionism as having guided him throughout his artistic career, serving not only as inspiration but shaping his understanding of colors and their functionality together in a palette or thriving apart. Water Lilies. 1920–1926. Oil painting by Claude Monet. 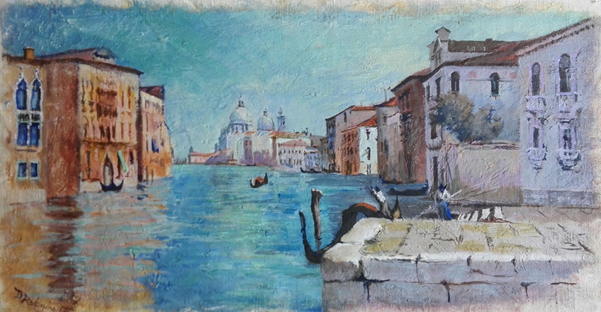 When asked about his motivation, the artist smiles and says: “My murals are an effort to show the beauty, the positive aspects of my country… a sort of incentive for the people of the world to appreciate the beauties of Italy in a different way from the usual, not simply through photographic posters that remain a cold and repetitive thing but through my personalized artistic expression.” His work is meaningful in an area where most has been said and done before, where icons have become not just symbolic but overtly generic. Through his works, he strives to “convey an emotion and to warm up the atmosphere of an environment” and imbue a human like quality, reintroducing life and personalization back into these big cities and reducing the gap between the two continents. In this way, he is using art not only to bring beauty into a space but also creating cultural exchanges between the two countries through art and culture. You can see more of his works here. Thank you very much to our artist Davide for taking your time in this interview.